I used to hate History at school and gave it up at the earliest opportunity. It didn’t help that my teacher was a great hulk of a man with a rather intimidating booming voice and wild, thinning hair. He was also the school rugby coach and his ‘party piece’ in History lessons was to remove his front false tooth, which he’d lost in a rugby accident. I’m sure the boys loved it but I couldn’t wait to get out of that dark dingy classroom. I wouldn’t say that I regret dropping History, but after nearly a year of living in a beautiful house that oozes history, in an area with so much history to learn about, I sometimes wish I had a better ‘history brain’. 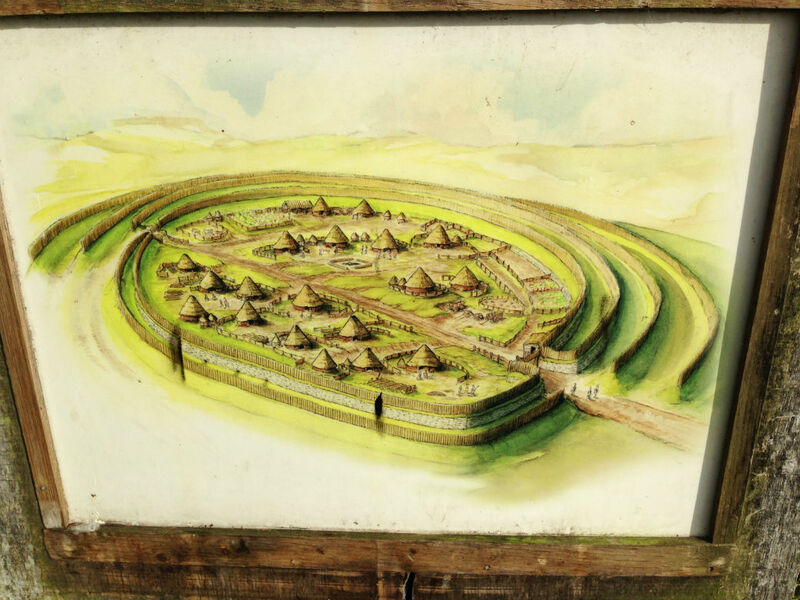 Right on our doorstep we have a piece of ancient history – we enjoy telling guests about Chapel Lawn’s very own Caer Caradoc with its Iron Age hillfort at the top, boasting some well-defined mounds and ditches but also some stunning views. As the date of this hill fort is unknown it’s a relief not to have to remember when it was built, but it’s likely to have been around the time of Caractacus (as with the other ‘better-known’ Caer Caradoc at Church Stretton) so we can hazard a guess at somewhere around 50 AD. There are also hill forts on several of the walks we’ve done since we moved here – at Coxall Knoll on our ‘Bryan to Lion’ walk and the impressive Bury Ditches (below) near Clun, which we visited last Sunday. Bury Ditches is ideally-placed for commanding views across the Shropshire Hills and Welsh Marches and there is a car park fairly close to the top of Sunnyhill, which houses the fort, if you don’t fancy the walk up from Clun or Guilden Down. It really is worth a visit, especially if it’s a clear day. The other nearby historical phenomenon that we often get asked about by guests is Offa’s Dyke. We have several leaflets and walk routes for sections of Offa’s Dyke path and we’ve walked what is described as the best-preserved section of the dyke itself on Llanfair Hill just a few miles north-west of here. One day I would love to walk the entire 177-mile path that crosses the English/Welsh border no fewer than 26 times, as my Mum and several friends have done. I’ve told visitors to The School House B&B of the way in which King Offa built up his kingdom of Mercia by getting his daughters to marry into the royal houses of bordering kingdoms, thus extending his supremacy across much of Middle England before eventually moving south into Kent and Sussex (hence the somewhat tenuous use of the word 'hegemony' in the title). But when people ask when Offa’s Dyke was built, that’s when the lack of a ‘history brain’ kicks in and I pick a random century out of the air. Perhaps now that I’ve written about it the response "late 8th century" might come a little easier to the memory!